Circleville, Ohio: Telesis is proud to announce the latest addition to our laser marking family - the UVC Laser Marking System. Our strong portfolio already boasts some of the most versatile and reliable systems in the industry, but with the addition of a UV based laser marker, Telesis has further fortified its laser marking flexibility. This very compact and air cooled UV laser marker gives the customer an additional choice when marking certain materials where traditional lasers at 1064nm and 532nm short. The UV laser with its 355nm wavelength is versatile in marking a wide range of materials is perfect for "cold marking" applications where heat zones are not allowed - the UV will mark plastics and silicon materials without the need of additives and will also mark glass with drastically reduced risk of microfracture. The excellent beam quality also affords this laser the ability to be utilized in micro marking applications such as electronics, circuit boards and microchips in addition to solar panels and precise medical marking applications. 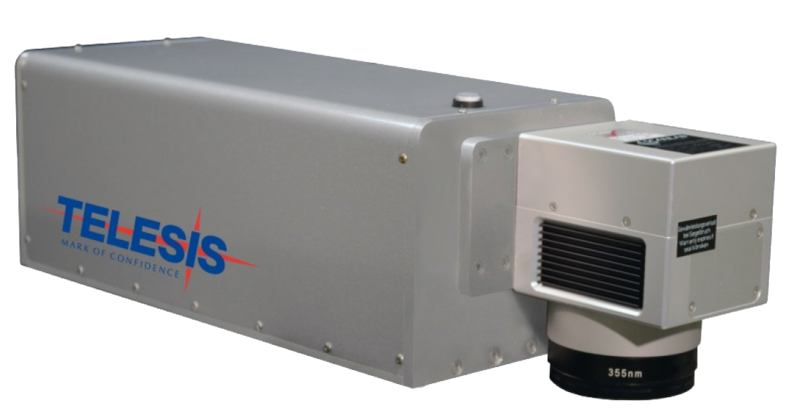 With its versatility, the UV laser boosts an already impressive laser lineup from Telesis Technologies. Ashot Mesropyan, Vice President of Engineering states that "The Telesis UVC laser marker could be a game changer for Telesis. Telesis already has an extensive applications background in traditional product identification markets such as automobile and heavy equipment manufacturing - this technology will allow us to couple our strong engineering presence with an extremely versatile marker suited to nontraditional marking applications in areas such as electronics. We are excited with the opportunities this laser opens for us." Telesis Technologies Inc. is the world leader in manufacturing standard and customized permanent parts marking equipment and systems-including gas, solid state and fiber laser, mechanical PinStamp®, and BenchMark® dot-peen systems and TeleScribe® scribe marking systems. Since 1971, Telesis has provided durable and accurate parts marking capabilities to companies the world over, from small shops to Fortune 100 manufacturing firms and governmental organizations. Telesis is now the most trusted brand in the parts-marking industry. For more product information and to view our other videos, please visit Telesis Technologies on the web at www.Telesis.com.